Discussion in 'Long Travel Suspension' started by rzimm001, Sep 10, 2010. King 10" coilovers w/ resi. 3.5" over long travel kit. Factory spindles w/ ALLPRO gussets. Total Chaos tower gussets. Energy Poly cab mounts and steering rack mounts. Glassworks fenders and bedsides. Home fabbed bed cage. King 2.5x16 bypass shocks in the rear. DMZ long travel rear end. Race radio (2meter). Removed secondary carbon air filter. Exhaust dumped before the axle / no muffler. Phram fresh air cabin filter. K&N replacement filter, After market stereo, Grillcraft grill, custom fabled roof rack with 7" HID's, PRP race seats. I'm in serious need of some hydraulic bump stops. I'm in more serious need of long travel, but I'm interested in trying the bump stops first. Especially since it fits into my budget better. I've busted my daystar evs bumpstops in half so I think they're not up to the challenge anymore. I'm curious where and how is the best way to mount hydraulic bump stops on the front of a 2nd gen Pre-runner? So far I've heard 2" stroke is appropriate. What about the height. At what point should they contact the strike plate? Do most people ride on the bumps so to speak? Why would you need hydraulic bump stops? Sounds like you have something else setup wrong if you're constantly hitting the bumpstops. No, you should not ride on the bumpstops. Never said I was constantly hitting the bump stops. But when I do hit the bump stops it would be nice to have more than a foam block to cushion the fall. I had a daystar bump stop installed on the shock shaft which worked decent for awhile. But now it's busted in half from jumping and hard riding. So how do you determine at what point the hydraulic stops should engage the strike pad? Are you offroading or are you towing or something? Do you have a lift on the truck? What is happening that's causing you to break the bumpstops? Maybe I didn't explain well enough. These bumpstops would be purely for recreational offroading trips. Which usually consists of pounding down a trail at speed and taking little jumps here and there. Sometimes I take some pretty good hits to the front suspension. As far as daily driving goes I have no issues with the bump stops. Basically I'm building a mild desert rig and I thought some good hydraulic bump stops would be a nice addition. A buddy of mine had them on his ranger and really like them. 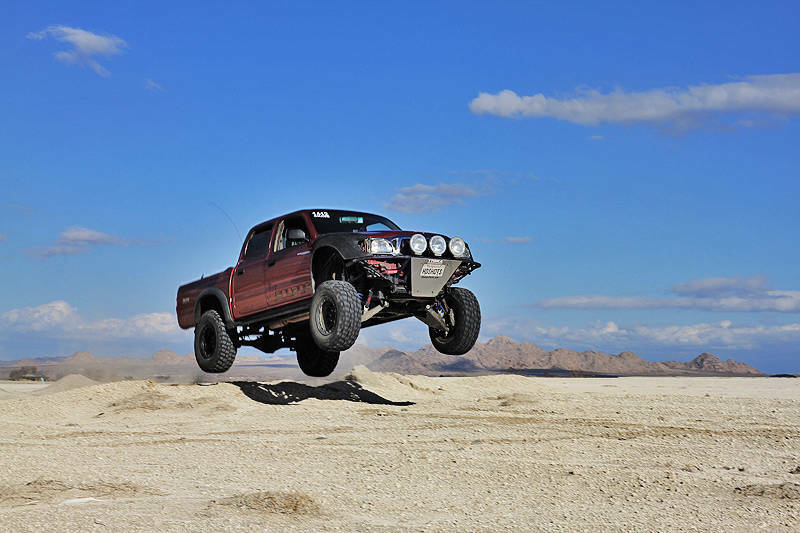 Think about the long term plans for your truck and then decide what to do for bumps. Camburg LT kits allows you to run hydro bumps but TC and Engage dont. Light Racing makes a nice bump setup but it wont work with a full LT kit. If I were you I would save and get a LT setup. The bumps are the least of your worries if you are taking hard hits on a regular basis. Well let's assume I really want to install them. Does anyone have some info on how to set them up in terms of mounting and ride height. You are able to run bumps with engage, Actually it is easy to do just no body has needed them in front yet but the race truck. The race truck front end is pretty close to the production lt kit. I know camburg likes to sell them with their kit. Check out polyperformance and they have some good fab parts for the bumps so install would not be that hard. I think you need to drive out to Texas and visit Matt for some free fab work. Here's a picture I have from a second gen with bump stops. These are built into the stock bump stop mounting locations. They just cut part of the stock bump stop off and welded in the cans. like Jan said, what are you doing to be bottoming out the front end? you trying to race without LT? The bumps are the least of your worries if you are taking hard hits on a regular basis. Thats cool that Engage allows you to run bumps on their kit. I asked about that like a dozen times and never got an answer so I assumed not. TC will not warranty a LCA breakage if you run hydro bumps up front. As for the free fab work come on down. I will be more than happy to practice my fabrication skills or lack of them on someone elses rig. I do the business side not the fabrication side. As for setting up the bumps. Go to TTORA.com. There is a really good LT tech section there with builders who know what they are talking about. There is a great option from Light Racing as stated before. This is not compatible with LT.
$980 bucks for a front set of bump stops....? Are you kidding me. That's the light racing front end kit for my truck. Who runs these things anyway. I never see jounce shocks at the races or maybe I just didn't look hard enough. As far as why I need them. I don't need them but a friend of mine ran them on his mid travel ranger and he was able to take some pretty narly whoops and small jumps. I've busted up my daystar ones so I thought it would be fun to try hydros. I mean hell they're only $400 material cost. FOA sells them with cans for even cheaper. I'll hit up the ttora guys and see what they think. Thanks for all the input guys! I wonder if it was these mounts or custom fabricated? I might do the front jounce shock kit by LR. A buddy is selling me part of the kit for cheap. I just need another jounce and the bolts. but idk if the LR jounces would fit in them? I think they have their own mounts.